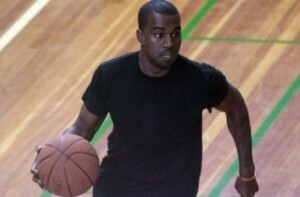 Kanye Scores 106 Points Against Junior Wheelchair Basketball Team, Makes Kids Cry. A charity basketball game did not go exactly as planned yesterday when Kanye West scored 106 points against the team of handicapped children in wheelchairs. The game was a PR move intended to smooth over the controversy that erupted this week to between Kanye and the disabled community. It all began when, at one of his concerts, West repeatedly asked wheelchaired fans to stand, and refused to apologize for his mistake afterwards. 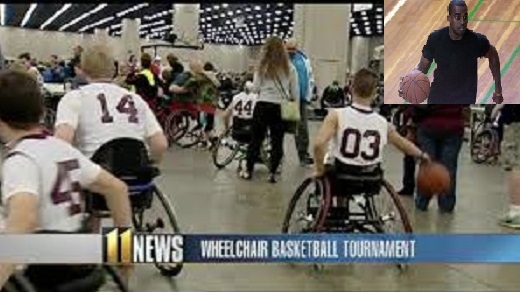 The Basketball Wheelchair Charity for Cancer Event pitted disabled middle school children against Kanye and his entourage. 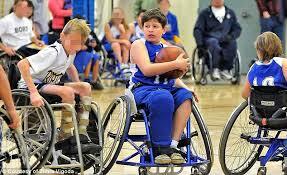 Kanye’s team seemed hesitant to play as hard since they were not also in wheelchairs as originally planned. After a tomahawk slam dunk that sent the basketball into seventh grader Peter Hill’s face, Kanye began yelling at the kid. “How do you like that? How do you like that? Sit before the great and powerful Yeezus!” One of West entourage members told him to take it “easy” on the kids but this only infuriated the 5 foot 8 hip-hop star. “Take it easy? Take it easy? Not me, not Kanye! I do everything 1,000%! You know that!” Kanye was heard yelling during a timeout. A stunned crowd continued to watch the game in the name of charity but several parents grew upset by the actions of West. Fred Skilling, whose sixth-grade son Sam, left the court crying, took him and his friend home after the first quarter. As more parents took their children out of the game Kanye began yelling, “Quitters! Quitters! Quitters!” Followed by laughter. Another parent was heard saying, “The guy donates $5,000 and he thinks it gives him the right to do anything he wants.” After the game, West told the media, “I set out to break Wilt Chamberlain’s record of points in one game and that’s what I did. It was for a good cause and I couldn’t be happier with my play.” The game ended in a score of 112 to 14. Kanye is said to have placed an order for championship rings to be made through Leon Jewelers of Beverly Hills.